Patches of dark skin around your neck may make you feel like covering up — even in the warmer months. 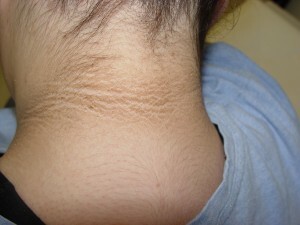 These patches can be caused by a number of conditions — hormonal imbalances, a skin condition called acanthosis nigricans (which literally means “dark thickening”), and eczema, among others. Finding the right solution for your particular case might require a trip to the doctor, or a little trial and error. There are also a few things you can try at home. See a doctor for testing. Darkening around the neck — especially if it occurs along with darkening of the skin in the armpits — may be an indicator of an underlying hormonal imbalance, possibly diabetes. Treating any underlying condition will help the dark skin to fade. Moisturize, moisturize, moisturize. If the darkening is caused by eczema or another skin irritation, moisturizing with a rich, fragrance-free cream or ointment will help calm your skin and soothe the rash. If your doctor has diagnosed eczema, apply a corticosteroid cream — such as over-the-counter cortisone — to the raw rash areas to speed healing. Lighten up. You can find creams that are specifically made to lighten dark skin — the most effective contain hydroquinone, which blocks skin from producing more melanin, a dark pigment. To get faster results, pair such a cream with an exfoliating skin cream containing retinoids or alpha hydroxy acid. Try a few natural healers. Vitamin E cream can be applied on the dark spots to help lighten the skin — massage it into the skin without rubbing it too vigorously. Aloe vera gel can also help lighten dark skin. Apply it twice a day to the darker areas. Consider using a gentle scrub. Scrubbing dark areas too aggressively can cause the skin to get thicker and even darker. But a gentle exfoliant — for example, a scrub made of sugar and olive oil — can help gently remove the dark skin. Whip up a home treatment. All-natural skin lighteners include lemon juice and yogurt. You can also whip up a mixture of almond oil, honey, milk, and lime juice — leave the mask on your skin for at least 20 minutes, then rinse it off. Protect your skin. Dark spots are generally made worse by the sun, so apply a broad-spectrum sunscreen with an SPF of at least 15 to protect the dark skin on your neck from getting darker. Try prescription treatments. Your dermatologist may recommend more intensive treatments, including prescription skin lighteners and laser treatments, to help lighten your skin.